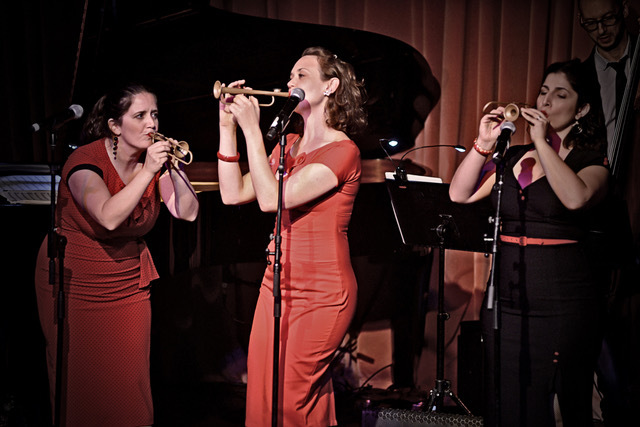 We’re making a LIVE ALBUM AT JAZZ STANDARD…and we need YOUR help! If you’ve ever attended a live Duchess show, you know how much fun we have. And by “we,” we mean the three of us (natch), but we also mean our band, the venue staff, and our amazing friends and fans. We love to share our music with all of you, and we especially love to laugh with all of you. Well, we want to capture lightning in a bottle, so to speak: on May 7 and 8, we’ll be recording our very first live album at one of our favorite venues, Jazz Standard, right here in NYC. There will be jokes. There will be swinging music. There will be Duchess cocktails. We’re crowdfunding this album, and we’re doing it without the big name crowdfunding platforms—and their hefty fees. We believe in the power of our Duchess Honey Buns to help us make this album a reality. EXACTLY HOW MUCH MONEY ARE YOU RAISING, AND WHERE WILL IT GO? Glad you asked! We’re putting every cent we make from this two-night engagement at Jazz Standard right back into this album. We need to raise $10,000 to make up the difference. Why aren’t you using KickStarter or PledgeMusic or any of the established crowdfunding platforms out there to raise funds? Good question! Well, each platform has its pros and cons, but the biggest, most universal drawback is that they all charge hefty fees. That means, in a nutshell, that if we used one of those big-name crowdfunding platforms, we’d have to overshoot the amount we actually need to make this record, just to pay a 3rd-party platform a surcharge. We’d rather keep our numbers as low as possible, and we believe in the power and dedication of our Duchess Honey Buns to help us make this happen on our own. You tour and perform all over the country. Why don’t you have the money to make this recording all on your own? Whoo, nelly, if we had a nickel for every time we asked ourselves that question, we wouldn’t need to crowdfund this album! Here’s the thing: yes, we do tour and perform as much as we can, but the fact remains that we are indie artists. What does that mean, exactly? Well, whatever fee we get paid for a gig (wherever it may be) has to cover: our airfare, lodging, rental cars, meals, and (last but certainly not least!) our band’s remuneration. We love bringing our music to the people, and the fun we have is priceless…but touring, it turns out, is expensive. Another fly in the ointment? When it comes to the music business, as the song goes, “things ain’t what they used to be.” CDs just aren’t selling anywhere near the way they used to, because most folks get their music from streaming platforms. Well. Those streaming platforms pay fractions of pennies. One stream of a track from one of our records will yield about $0.0038 on Spotify. What’s $0.0038 divided three ways? We’re not sure of the math, but we know it doesn’t add up to rent, let alone the cost of making another album. But here’s the thing: we believe that recording music is important. Whether you listen to our music on a CD, the radio, or via a streaming platform, we hope it brings you joy. That’s why we’re making this record. More music = more joy. when will “Live at jazz standard” be released? We’re planning a September 2019 release on Anzic Records. To pay by credit card, please send an email to duchesstrio@gmail.com with your phone number and a good time to call you and we will process the card over the phone. Hijinks. Hilarity. Harmony. Kazoos. Who could ask for anything more?